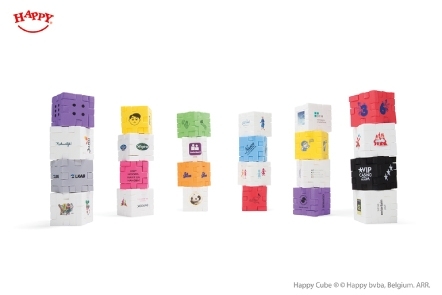 Customize your own Happy Cubes! With screen or digital full colour print. With a flow pack and a customized card if you like. The budget friendly 3,5 cm Planet Cubes. Various sizes and difficulties available. Win the heart of your clients with your custom framed cube. 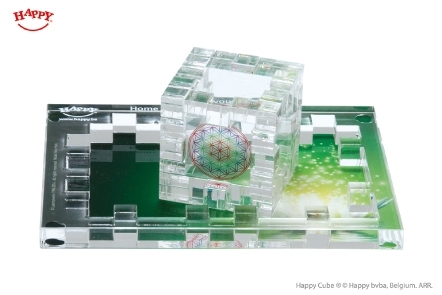 The Happy Cube Acrylic as premium gift. Create your own cube display. The Happy 3D Puzzles are great product-ideas that make the customer think, act and smile, stimulating the mind like no other product can. 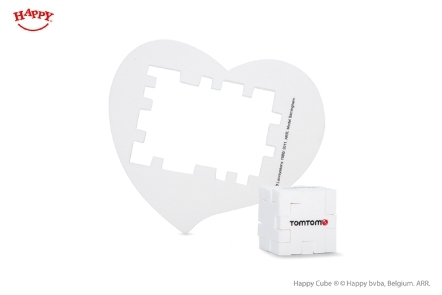 As a promotional gift, the cube puzzles can carry your logo, in your company colours, together with any message that you want to put across. 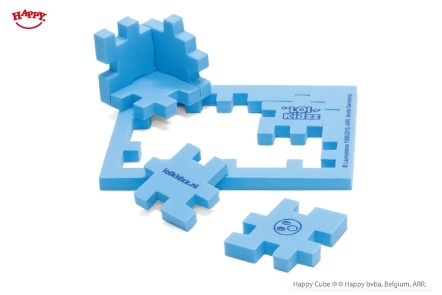 The Happy 3D puzzles, made out of a soft high quality EVA foam, are fully customizable. Not only can you choose the size, shape, difficulty, colour and printing, you can even design your own frame which we'll cut into shape. 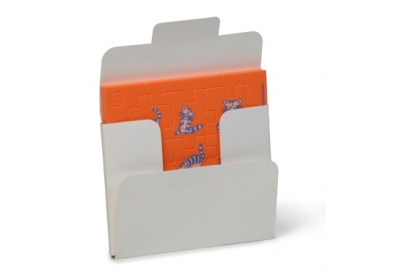 We provide you the flexible promotional solution you're looking for! 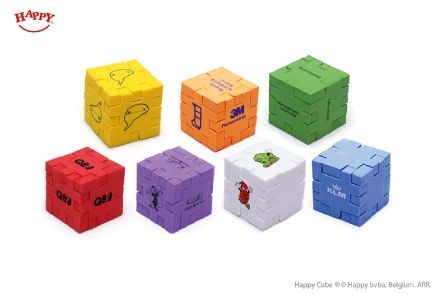 How to customize my own Happy Cube puzzles? Send us the details of your desired pantone colour to find the match in our colour line. If you want to know the minimum quantity order of the product of your interest, please contact us. Send us the details of your desired pantone colour. If you want to know the minimum quantity order of the product of your interest, please contact us. 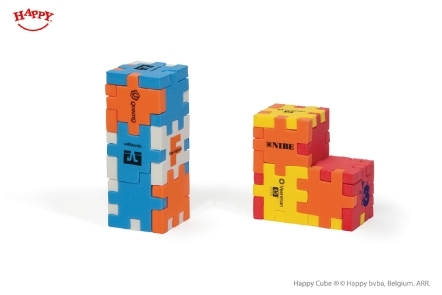 The Happy Cube puzzles are available in different sizes. A bestseller is the Happy Cube 4 x 4 cm. The chart below gives you an overview of the possibilities. Do you want more information about printable surfaces on the puzzle pieces or about the available difficulties? We have it all worked out for you in a practical chart! 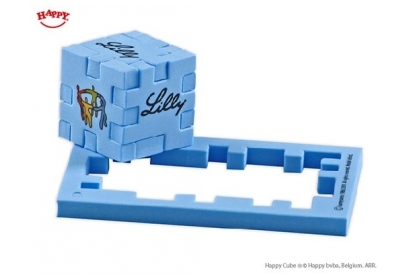 We have 101 different unique Happy Cube puzzle models ready to be customized for your customers! 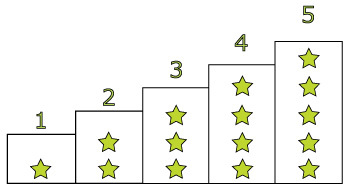 Choose the difficulty level according your target group to maximise the game fun for the player. Super easy: model Baubox, suitable for children from 3 to 6 years. Easy: models Barcelona and Bora Bora, starting from the age of 5. Medium: models Bratislava and Birmingham, relevant for adults and children older than 10 years. Hard: models Sevilla and Oxford, for adults and smart children. Mind boggling: model Space Cube, for extreme genius puzzlers. Contact us for assistance in case you would like to have your message in a particular form on the cube. 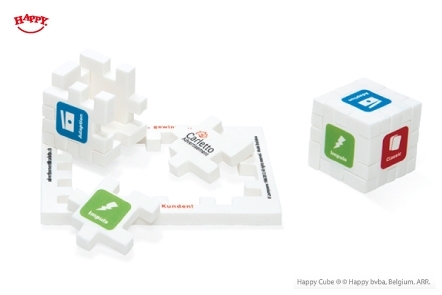 Many puzzle models can be combined together, so you can totally tune up the Happy Cube puzzle concept to your specific aim, message and audience. 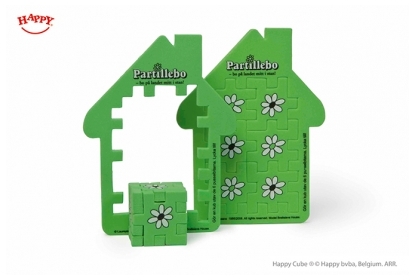 We offer you 7 interconnectable puzzle model sets to make multicolour cubes or bigger puzzle constructions. They are perfectly suited for special events or 'collect them all' campaigns. The model sets are listed below starting with the most economically interesting option. The 4 layout combi model set consists of 4 different puzzle models in 1 foam colour of your choice. They can be printed with up to 4 different layouts for the price of only one film set-up, with no extra handling costs. 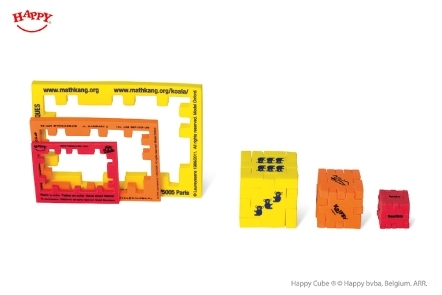 The 2 model combi set consists of 2 different puzzle models in 2 different foam colours, standard printed with the same layout without mentioning the puzzle model. Print a different layout on both puzzles. Mention model name on the puzzles. 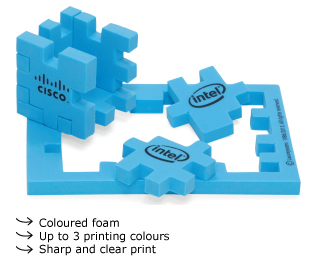 The 3 model combi set consists of 3 different puzzle models in 3 different foam colours, standard printed with the same layout without mentioning the puzzle model. Print a different layout on all puzzles. 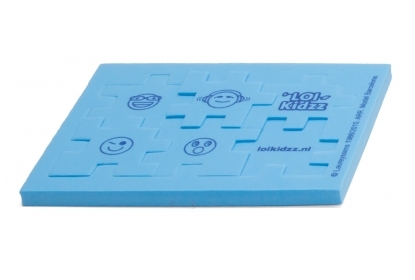 The 4 model combi set consists of 4 different puzzle models in 4 different foam colours, standard printed with the same layout without mentioning the puzzle model. 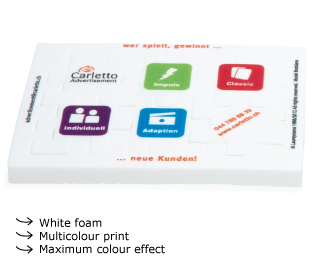 The 5 model combi set consists of 5 different puzzle models in 5 different foam colours, standard printed with the same layout without mentioning the puzzle model. The 6 model combi set consists of 6 different puzzle models in 6 different foam colours, standard printed with the same layout without mentioning the puzzle model. 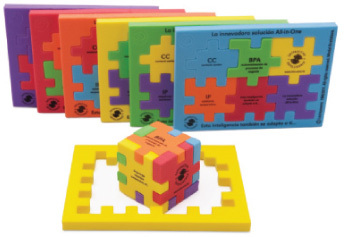 The 6 colour mix model set consists of 6 puzzles in the same model in 6 different foam colours, standard printed with the same layout without mentioning the puzzle model. After cutting the puzzles, the pieces will be switched manually to get the colour mix effect. Standard the Happy Cubes puzzle pieces are packed in a rectangular frame. However, if you are looking for an extra special give-away, customizing the frame enables you to even work more theme based specific. Standard we deliver the Happy Cube puzzles in bulk. Because the puzzle is packaged in its frame, an extra packaging is not essential. 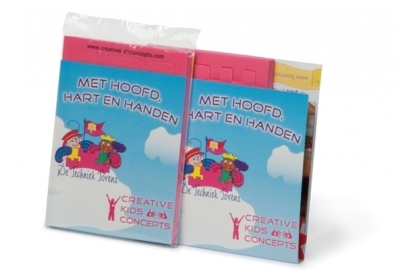 However, you can emphasize your company by adding a customised promocard (single or double) within a flowpack packaging. 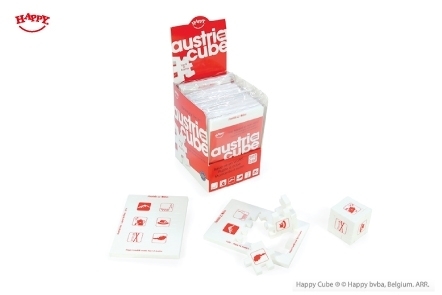 This also creates the possibility to explain the game elements of the Happy Cube in detail. 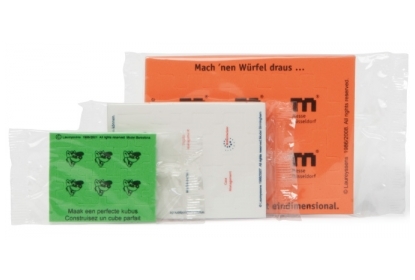 When you use the Happy Cube as a direct mailing item, we recommend the envelope, which can also be fully customised. 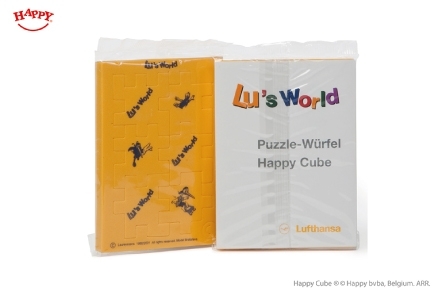 Discover our other fun 3D puzzles like Happy Cube Acrylic, Planet Cube, Logo Surface Puzzle and some special 3D puzzles. Once you have gone through all the steps and made your choice, fill in the price quote to ask for a tailor-made offer. With the order you will receive our Happy Cube template and detailed guidelines, enabling you to make a print-ready design. These guidelines have to be read thoroughly by your designer because printing on foam is not the same as printing on paper. In short, we already want to inform you that details smaller than 2 mm in your layout partly disappear and will not be visible after printing on the foam. For positioning reasons a tolerance of 2 mm between different coloured lines and objects has to be taken into account (screen print only). We are looking forward to your creative design! Puzzle a cube with the 6 foam puzzle pieces, then put them back into the frame. 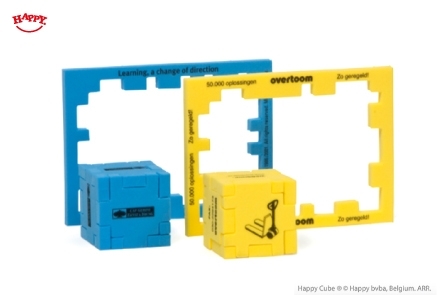 Combine cube puzzles to create impressive constructions.